Well, it turned out to be a working vacation. In addition to approving artwork via laptop on another project, I finished the script to The Phantom Claw. So the script is in Mike's hands right now and I await his notes. There are many added scenes that weren't in the treatment, most about Kate and Hellboy but some added paranormal elements and villain motivation. Fingers crossed. Of course, Mike just got back from the London production office of HB2. I'm sure Guillermo ran him ragged so I'm not sure he's even awake yet. Meanwhile, no green light yet but when I have time I proceed as if we have one so that means organizing reference for my crew. 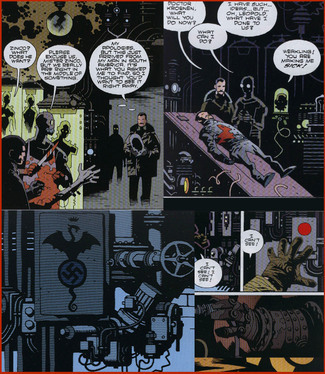 As I've said previously, The Phantom Claw highlights the "mad scientist" side of Hellboy and nobody designs a mad scientist lab like Mike Mignola. This collage, along with several others, showcase the retro look to the equipment that Rasputin and his followers used to bring Hellboy to Earth. The images should not only help the design of background layouts but a variety of props too. As Mike has also mentioned in various interviews, Hellboy: Blood and Iron has the feeling of a Hammer film and The Phantom Claw will have more than a wink and a nod toward the classic monster movies of Universal Studios. So I've also been watching The Bride of Frankenstein and Son of Frankenstein. 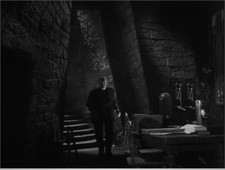 Those films had fantastic art direction, twisty staircases, incredibly high ceilings, and strange shadows. Too often, animated backgrounds smack of rulers and T-squares. Hallways are rectangular, furniture generic. Mike and I hope to use the Universal masterpieces to inspire the crew to create a truly unique Castle Drachespitze, the scene of most of the action. I can see where you are going with the art direction and it should prove worth while (I agree about the straight lines and right angles in today's animation). This could be the best one yet. Can you let us in on any of the DVD extras for Blood and Iron yet? I can't wait too see how the Hellboy Animated art style takes with Mignola's unique mad scientist lairs. I'm sure it's going to rock. P.S. I saw Blood and Iron, it was sweet. Keep up the good work man! Excellent update! You are watching the perfect movies to prepare for this! For more classic 30s mad scientist design esthetic, definitely check out Doctor X and Mask Of Fu Manchu in the recent Hollywood Legends of Horror DVD set. Lots of test tubes bubble and electrical gizmos zap, you know the drill. Any and all updates on the Blood & Iron DVD, plus any merchandise connected to it, are things I desperately desire to read! And, as always, thanks for all the TLC you are putting into these projects. as a huge fan of the Hellboy comics and film, i cant tell you how much i loved Sword of Storms. You guys have so got the right attitude for these films. Im eagerly awaiting the release of Blood and Iron (by the way, the trailer was Amazing! )and I really hope you get that green-light soon - and keep up the good work! it seems that with every dvd that's produced by all of you, just gets better and better.cannot wait...i'm so excited for all things Hellboy!! Blood and Iron DVD extras will include another behind the scenes doc. There's another dazzling commentary of course. There's an "eComic" version of Mike's short story, "The Penangalan" which was a Wizard exclusive comic. There's a feature that reorders the various flashbacks of the feature but the big extra is a two minute, never broadcast, Hellboy cartoon. As for merchandise tie-ins, if you liked the Bust-Up figures that were included at Best Buy stores, your head will explode when you see what they have in store for this release. There's more but I've said too much!!! Wow...mad scientists, old horror movies, Lobster Johnson, and more Hellboy & Kate? The first two movies were great, but this one already sounds like it's going to be my favourite. Blood and Iron was excellent - I loved the pastry argument :). Just want to echo what others have said here: thanks for doing this blog, Tad. It's always a treat to be able to see what goes into making the movies you love. gah! my fanboy head cant take all of this...soooo hyped to see whats in store. fingers crossed.